But I digress, yet again! I love Rachel's style of scrapbooking and have been inspired by her layouts on Pinterest multiple times. Here's a layout that I just loved the other day. So the beauty of stamping and scrapbooking and really art in general is that you can use it for a source of inspiration and go from there. I used her basic layout and changed it up to be this! 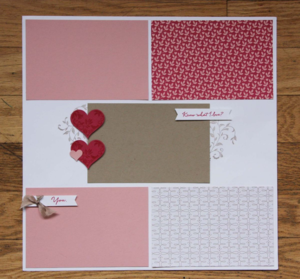 Layout Class makes Scrapbooking a cinch! Join us on Feb 18th!